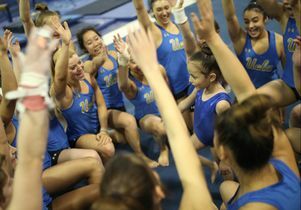 Hard to say who enjoyed the day more, 6-year-old Joselin Palma or the UCLA gymnastics team. 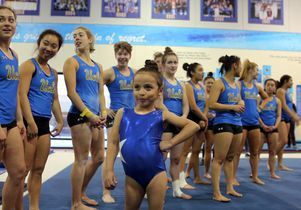 Most 6-year-olds are bouncy, but not quite like Make-a-Wish kid Joselin Palma, who spent this morning springing, leaping and dancing with the entire UCLA gymnastics team. 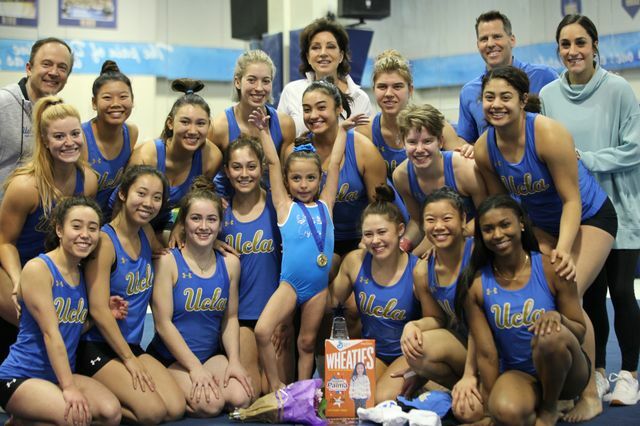 The team followed Joselin around UCLA’s Yates Gym, cheering for her cartwheels on the mat and her flips on the parallel bars, and holding up signs with a score of perfect 10. 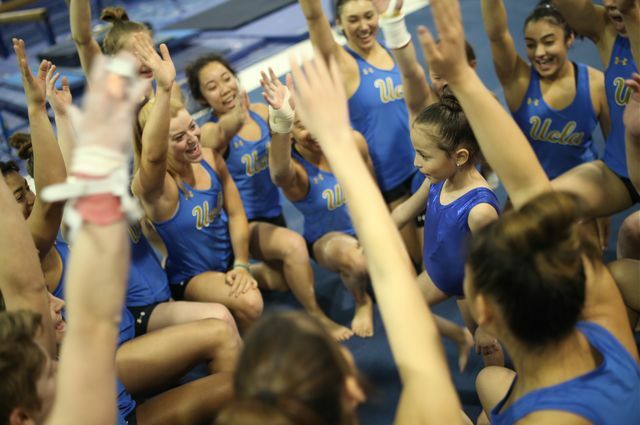 As Joselin crossed the balance beam 2016 Olympic gold medalist Madison Kocian and NCAA team champion Grace Glenn held her hands and the other Bruin gymnasts took turns asking Joselin what she wanted to try next. 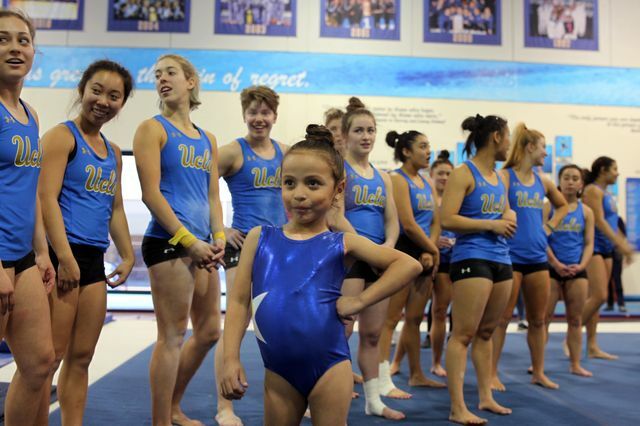 Although she was born with a gastrointestinal disorder that requires her to wear a medical device for up to eight hours a day to receive nutrition, Joselin loves gymnastics and takes weekly classes. Making her dream a reality became the 10,000th wish granted by Make-A-Wish Greater Los Angeles. 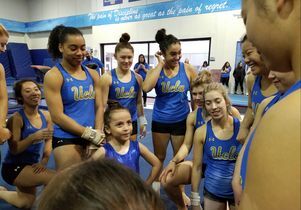 The UCLA gymnastics team was honored when they learned Joselin wanted to be a UCLA gymnast, said head coach Valorie Kondos Field. “It has been so exciting to see her face just light up, and equally heartwarming is seeing the tears flow down our student-athletes’ faces as they’re helping her from event to event and hugging her,” Kondos Field said. Joselin already has the attitude of a performer. 2012 Olympic gold medalist Kyla Ross marveled at Joselin’s spirit and skill. 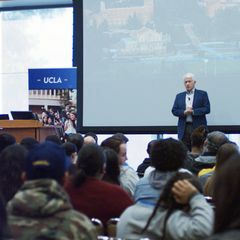 Joselin was already excited to make the 27-mile visit from her hometown of Santa Clarita, but her love of UCLA gymnastics exploded in January when she saw the viral video of UCLA gymnast Katelyn Ohashi performing her floor routine, said Joselin’s father, Gabriel Palma. The team pulled Joselin into huddles and made her the center of attention. 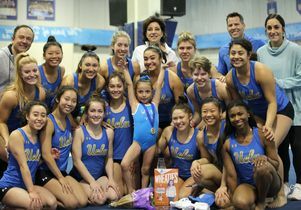 As the visit wrapped up, they draped a gold medal around her neck, presented her with armfuls of UCLA gear, and gave her a box of Wheaties featuring her name and photo. As Joselin beamed, her parents and visiting media snapped photo after photo. 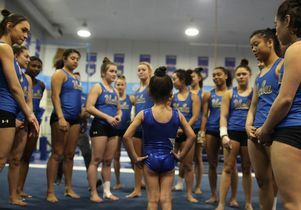 6-year-old Joselin Palma with the UCLA gymnastics team.